​﻿Located near the south coast and surrounded by Sussex countryside there is plenty of access to local fresh fish and produce, which we take full advantage of. Our restaurant can seat up to 50 and offers daily specials with fresh fish and seasonal dishes as well as homemade puddings and our superb traditional Sunday lunch. In the summer months you can choose to sit out in the tranquil garden area to enjoy alfresco dining. From light lunches to three course sittings, our aim is to offer hearty and delicious food that can be enjoyed in a friendly and relaxing environment.  At the heart of The Old House at Home is a traditional pub bar with a range of real ales, quality lagers and an interesting and varied wine list. Many of our ales are supplied by independant breweries including, Palmers of Bridpot in Dorset and Langhams from Lodsworth in West Sussex who produce our very own bitter - Chidham Best.